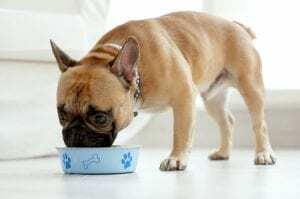 If you’re a first-time French bulldog owner, you may be wondering what to feed your sweet, lovable companion. At Family Puppies, we’re dog-care experts who take pride in feeding our puppies the best food available. In general, French bulldogs should eat food designed for small to medium-size dogs. Depending on the dog’s size and age, he or she should eat two to four meals per day. Be careful not to overfeed your French bulldog. Because French bulldogs are a brachycephalic (short-nosed) breed, becoming overweight can make it harder for your pooch to breathe. Particularly in the winter, when exercise options are more limited, make sure to limit your pup’s food intake. Look for food that has a mix of complex carbohydrates, lean animal proteins and fruits and vegetables. Choose foods that are made from whole, rather than processed, ingredients. When feeding your French bulldog, there are a few things to avoid. With some French bulldogs, wheat products can cause In addition, be careful of corn products, which can lead to rashes or skin irritation for your pup. Fillers are another no-no: they have no nutritional value and can cause allergic reactions. Family Puppies has an adorable selection of French bulldog, Havanese, Coton and Cockapoo puppies. Our puppies are like family—our two daughters and four sons play with them each day. Contact us today to learn more and ask any questions you may have. We can’t wait to help you find the perfect addition to your family!